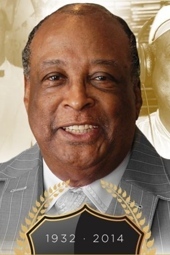 The night before East Austin’s legendary gospel announcer and promoter Bill “The Mailman” Martin was laid to rest in April 2014 at age 81, there was a musical memorial at the St. James Missionary Baptist Church on MLK pastored by his father-in-law E.M. Franklin from 1953 –1981. The songs were mournful, the speeches reverent on that Good Friday. Bill Martin was an actual mailman in East Austin for three decades before he took over for his mentor Elmer Akins as the face and voice of black gospel music in Austin, so he was doubly beloved. Sad to think that we’ll never again engage with Brother Bill, a man so full of life and care. The Chariottes, with Evelyn Franklin third from the left, briefly recorded for Duke Records. The ‘60s were a great time for Evelyn’s older brother Junior, who had become a major player in the national gospel scene by co-founding and managing the Mighty Clouds of Joy, as well as playing guitar and singing harmony. 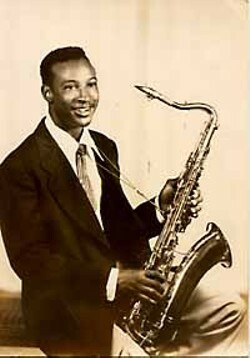 Junior Franklin moved to L.A. in the late ‘50s and started a new version of his Austin group Sensational Wonders, who played the same circuit as a teenage holy ghost shouter from Troy, AL named Willie Joe Ligon. What Ligon liked in the Wonders was a full band backing, unheard of in gospel at the time. In Ligon, Junior saw a singer who could match the intensity of June Cheeks and Archie Brownlee, the two greatest hard gospel voices of the ’50s. Together they became the Mighty Clouds of Joy, a group that revolutionized gospel music. They were called “The Temptations of Gospel” for their soul and choreography. But even more significantly was the funk bass lines they brought to religious music. Such current Texas gospel acts as the Relatives and the Jones Family Singers are direct descendants of that Motown gospel sound. Junior Franklin moved back to Austin in ’79 to see after his ailing mother. At the time, Bill was delivering mail all over East Austin, then after work he’d get together with Elmer Akins, a man he met on his route. Also originally from Pilot Knob, Akins had the “Gospel Train” radio show on KVET from 1947 until his passing in ’98 and also promoted gospel concerts, usually at Doris Miller Auditorium. They’d attach a loudspeaker to the top of Akins’ car and Martin would drive while Akins barked. “The Soul Stirrers, with Austin boy James Medlock, are playing this Saturday night! With Shirley Caesar from the Caravans! Come to the program! It’s a joyful noise!” At the corner of 12th and Chicon, Martin would pull over as Akins, 21 years his senior, played records by upcoming acts over the loudspeaker.